Check out the Live Music News and Review.com Facebook page for more of Steven’s photos of the concert. The Last Waltz 40 Tour started with one-off shows in New Orleans where Don Was, Warren Haynes, Michael McDonald and Jamey Johnson fronted the band. The enthusiasm from the crowds those nights was more than the band expected, so they decided to craft a tour from it. 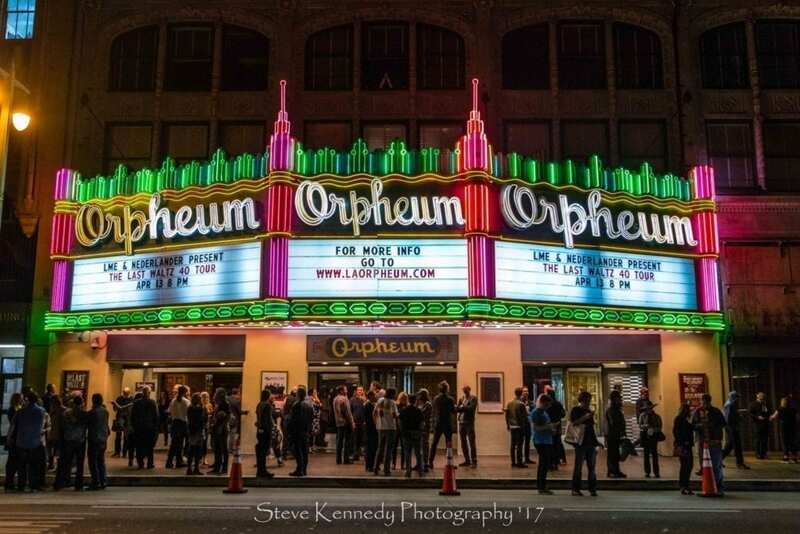 This night the tour landed at the beautiful Orpheum Theater located in the historic theater district of Los Angeles. It was a full house even though surprisingly it was not a sellout. In case you didn’t know, The Last Waltz was the last concert ever by The Band. They were known for backing Bob Dylan in the 70’s and also producing a stack of classic American music. The original concert was produced by Bill Graham and a movie was made by Martin Scorsese. Many have called the movie one of greatest concert movies ever made. The show took place at the Winterland Ballroom in San Francisco on Thanksgiving Day 1976. The show lasted over 5 hours and featured an all-star guest list too long to list here. A few of the notables were Bob Dylan, Eric Clapton, Van Morrison, Joni Mitchell, Neil Young, Ringo Starr, and Muddy Waters. Oh wait- there’s more: Ronnie Wood, Dr. John, Paul Butterfield, Neil Diamond and Stephen Stills- OK you get the gist; I’ll just stop it there. The 2017 version honoring this historic show featured and all-star cast in its own right. Throughout the show guest appearances kept taking it to new levels. The night kicked off with “Up on Cripple Creek” with country star Jamey Johnson taking the lead vocals. From there they went into “Stage Fright” with Warren Haynes taking over the vocals. The third song of the show was the first twist for me, “Georgia.” Jamey Johnson’s powerful country vocals were perfect and Warren Haynes dropped an inspired lead from his black Stratocaster guitar. At this point I knew we were in for a treat. The set continued with Van Morrison’s “Caravan” followed by “Makes No Difference.” The sixth song of the night brought out the first guest appearance of the night, Cyril Neville of the Meters, and- wearing a purple suit and trademark flat-brimmed hat- Dr. John. Dr. John sang a fitting song that would help define the evening’s festivities, “Such a Night.” To hear one of the original cast of the show, Dr. John, sing was fantastic. They followed that up with another tune which helped steer the show into a decidedly New Orleans jam vibe, “Down South in New Orleans.” They quickly followed it up with Cyril Neville singing “Who Do You Love.” Jamey Johnson took the vocals back for “Rag Mama Rag’. The night’s next guest, Taj Mahal, joined in for one of my personal favorites, “Shape I’m In.” He seemed to really enjoy himself all night, smiling and clapping along to the tunes. He stayed on and sang, “King Harvest (Has Surely Come).” They closed the first set with a fan favorite, a song sung by Levon Helm at the original show, “The Night They Drove Ole Dixie Down” Again, Jamey Johnson’s vocal inflections really helped to retain the southern spirit of this classic song. Next up was another guest who played at the original concert in 1976, Bob Margolin. Bob was Muddy Water’s guitar player and was only 27 years old at the time he played that show. He talked about being there that night and how he wished Muddy would have played the slide guitar. He said he would play the slide tonight and “lay down the pipe”. Bob really kicked the energy up a notch with his vibrant personality and on stage antics. Bob ad Warren traded licks as they shredded the blues classic, ‘Mannish Boy’. Bob told a story about the late night into the morning dawn after hours blues jam at the hotel which featured Bob Dylan, Eric Clapton, Paul Butterfield, Levon Helm and Ronnie Wood. To be a fly on the wall at that jam. He said they played blues standards by the great Robert Johnson. Then, joined on stage by Taj Mahal, they went into ‘Kind Hearted Women’ followed by Warren Haynes singing Eric Clapton’s ‘Further on up the Road’. The show started to move into the climax with the playing of Bob Dylan’s inspirational, ‘Forever Young’ sang beautifully by Taj Mahal. It was a truly stellar evening. The brainchild of bass player Don Was, who is one of the music industry’s most sought-after producers and Blue Note record CEO and renowned axe man, Warren Haynes. They gave life to such an inspiring catalogue of music. They paid tribute to a great night, a great band and musicians from an era of music that will live on forever.